When I turned forty, I decided that perhaps it was time to start buying my clothes in M&S. Dutifully, the next time I went shopping, I put M&S on the top of the list as the place to start. It didn’t go well, I walked swiftly through the clothes section to the food and bought myself a slice of cheesecake. Because that’s what I do at M&S. Buy food. Maybe something for the children (school clothes) and possibly something from homewares. But clothes, no. My mum (sixty-something) walks into M&S and says it looks old and my seventy-something mother-in-law often declares that it’s old-fashioned (she prefers John Lewis, cue eye-rolling). Last week whilst being out and about, I found myself near the Marble Arch M&S, so I thought, it’s a flagship store, let me face my fears and have a look what I could find. I lasted about 4 minutes before I wanted to run out into the street screaming: “I see dead people”. After this failed attempt I set myself the challenge to go back and see if I could find a selection of clothing that I would be happy to add to my wardrobe. My daughter was with me, she’s not a big fan of shopping, but she was was having a particularly patient day. She was, like me, less than impressed with the look of the shop. “It’s ok”, she says, “if you lived-in the last Century”. Yes, she nailed that one with the infinite wisdom of an eight year old. I don’t think it’s so much the clothes, there are some lovely items to be found (once I stopped hyperventilating), there is just something about their merchandising that is an epic fail. I spotted a pair of trousers on a poster that looked fantastic, I’d wear them, but to find them I had to search to through a trouser department that had some of the most godawful frumpy beasts, it almost sent me scuttling away in fear (never to return unless it was a quick rush for the food department). Needless to say I couldn’t find them, they had no stock, so my M&S selection does not include a pair of trousers. They also have too many options of everything. We don’t know what our customers want, lets buy everything. In every colour, and then throw it all in the shop at the same time to confuse the hell out of them. There are some good things amidst some truly frumpy monstrosities, but who has the dedication to rummage through the duds to find the gems? I think that this lovely striped dress (£69) was the first item that I spotted which gave me a little glimmer of hope. At first I thought it was a shirt though, that is what it looked like on the hanger. M&S show this dress on their website with black shoes and accessories, which personally, I don’t like. It dilutes the fun and summery aspect of the dress. The fabric has a nice weight to it, the construction makes it a very good fit. Another pretty summer dress (£55) from M& S, but again, I don’t like their “Complete the Set” selection on their website. I would team this with denim and a bright bag or shoes to make it look more fashionable and appealing. 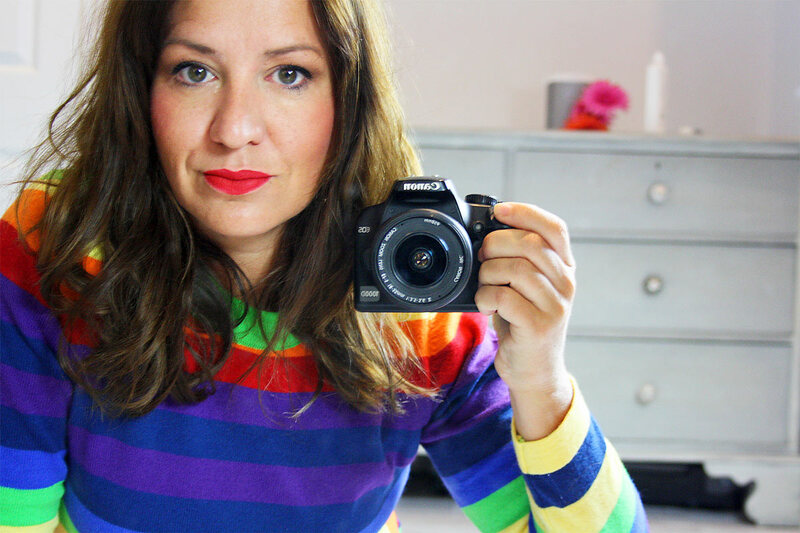 I have to be honest, I love the striped fringe jacket (£55) pictured above. It is a perfect spring jacket for work and play. All the seams have a small fringed edge, which prevents the fabric from looking too old or too serious. Good job M&S, it’s gorgeous, that is about all I can say. Unfortunately it looks like online shoppers love this shirt as much as I do, because the stock for the Chambray cotton striped poplin shirt (£39.50) is low on their website, but at least they still have stock in the shop. It’s a great shirt, dash out and invest. It’s a fabulous shirt to have in your wardrobe for work and weekend wear. I came across a Pure Cotton Trench in a colour they call Cinnamon (we like) for £79 which I think is a fantastic buy. I am somewhat prone to the utility look, so I love this coat despite the fact that my daughter told me that I look like Inspector Gadget. The coat is unlined and treated with water repellent technology, making it perfect for those cooler damp Spring days. I didn’t spend much time in the shoe department, I’d reached my M&S shopping limit (too much overload trying to find the good stuff amidst the vast assortment of options), so a quick scan brought me to pick up a pair of suede block heel ruffle sandals (£45) in Flame. I’ve always been a sucker for a red shoe. These low heels are perfect for feeling dressed up whilst still being practical running after unruly children. These are brilliant for a holiday pack to add a little colour to a plain dress or outfit. I would have liked to add some trousers or a skirt to this blog post, but there were too many average-looking jeans and trousers. It felt like a bit of a slog to choose a pair for the sake of it. One should take into account that I chose to shop in their biggest store, therefore should expect a large selection of clothing. I do feel that their success is hampered by visual merchandising that is uninspiring and a shopping experience that falls a couple of yards short of my expectations of a fun day out. Unless I’m in the cheesecake aisle. Great post, really interesting … I love the navy stripe jacket and sandals in particular, but I agree, in general M&S is for food only! 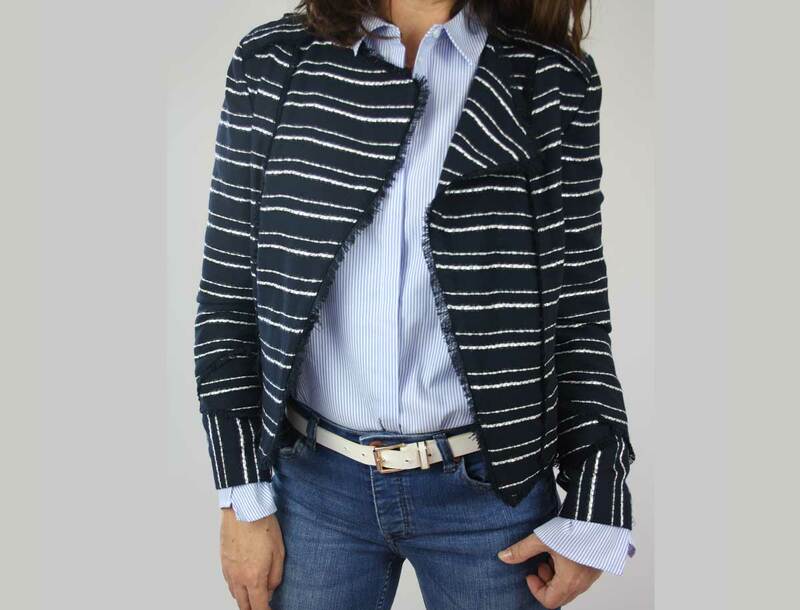 I think the stripe jacket and sandals are my favourite too! I was on a mission, or I might have done ended up with similar!